I always love the opportunity to design a room for someone I know, especially someone with as cool of a pad as my recent client Kerry. She and I are friends who used to work in consulting together. While I quit to stay home, she spent years working in Europe and traveling the world! She recently bought a brownstone condo in the South End neighborhood of Boston. It is a beautiful space with an open kitchen and living area, and quaint Boston details like an exposed brick wall. I was thrilled when Kerry reached out to me to help decorate her new space. I could tell from the photos she sent that she had collected some colorful art from her travels and I wanted to create an urban space with some global patterns to highlight those pieces. Kerry has a great red buffet piece similar to the one above. We decided to make this the focal point of the room by moving it under the TV and serving double-duty as a TV stand. That freed up the exposed brick wall for some open shelving to display photos and other mementos from her travels. I suggested some pops of red throughout the room to complement the red buffet piece and her colorful art. I chose side tables and chairs that can easily be moved around in a small space to make room for extra company. 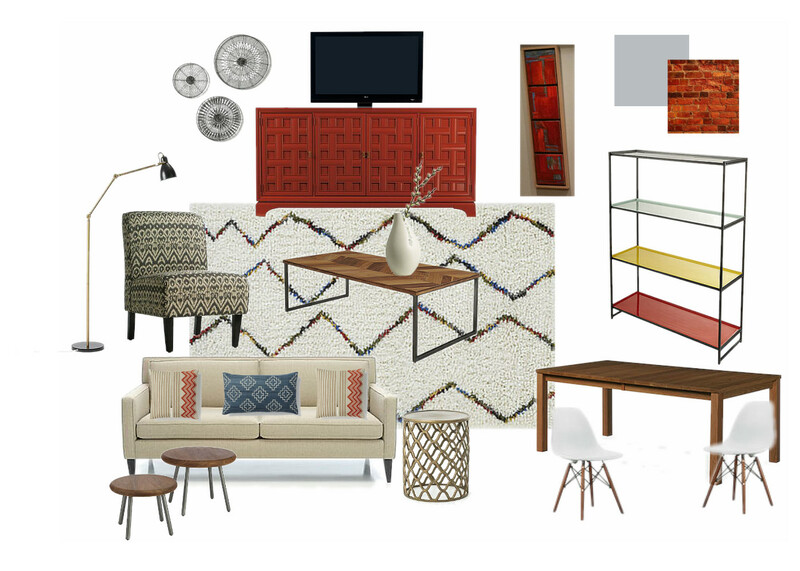 Kerry is in the process of pulling the room together and has already found a great cream sectional sofa with clean lines and a cozy rug inspired by this design. I’m excited to see how the room comes together!